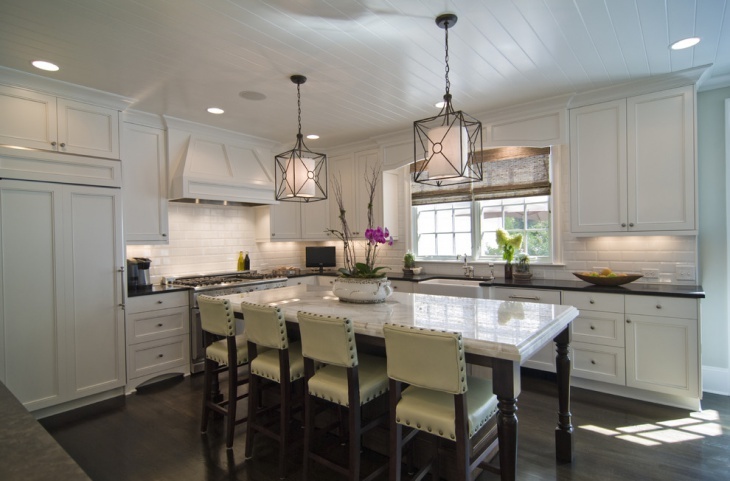 Use of pendant lighting is becoming very popular these days. 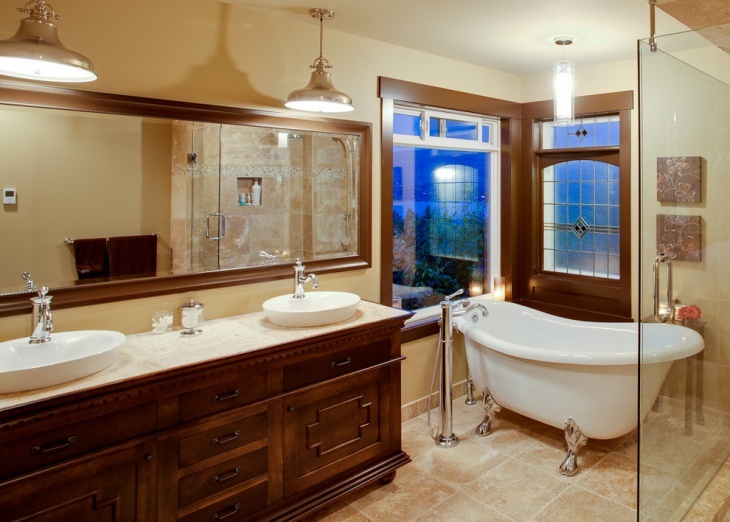 They are the economical substitute for the expensive chandeliers. These hanging lights are great to use anywhere in the house. The wide variety of designs, sizes, and styles allow you to choose the right one for your specific project. 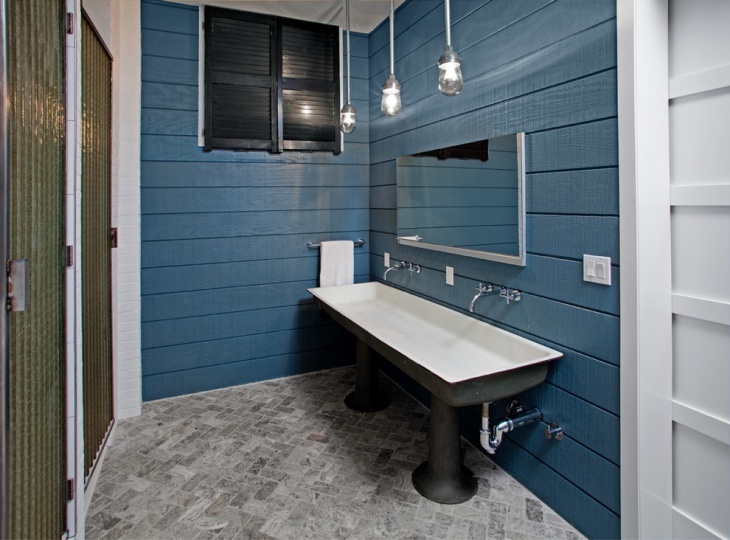 If you want to go for the industrial look, you may want to check out these samples. 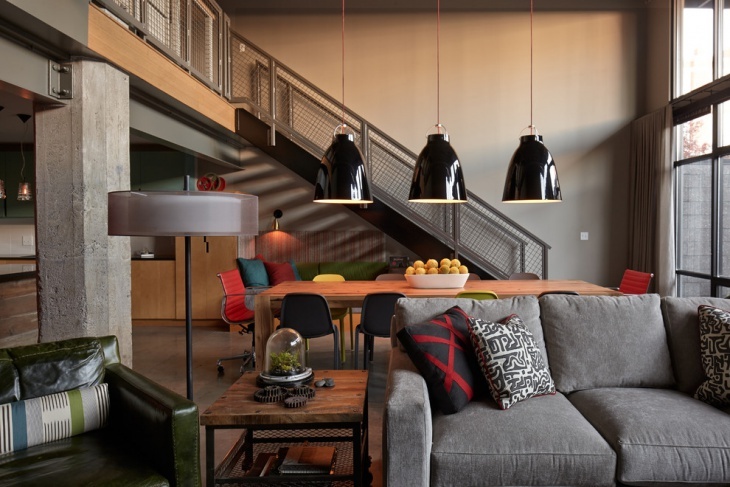 Industrial lighting can easily turn a modern interior into a rustic. 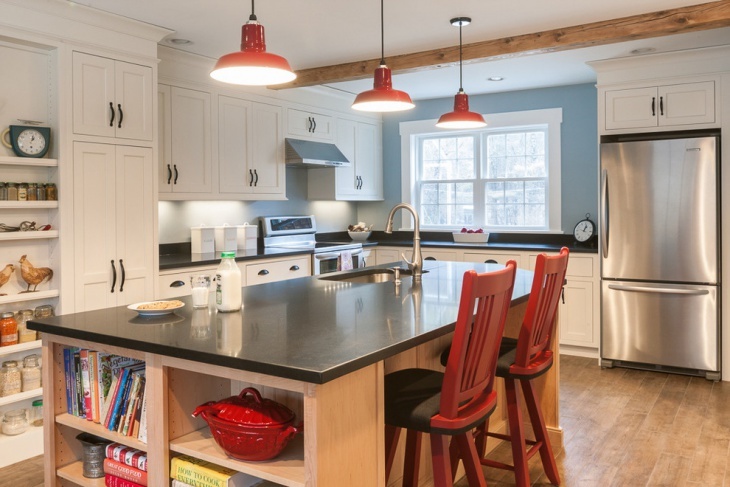 For this kitchen, the exposed ceiling beams provided a nice base for the series of pendant lights suspended over the kitchen island. 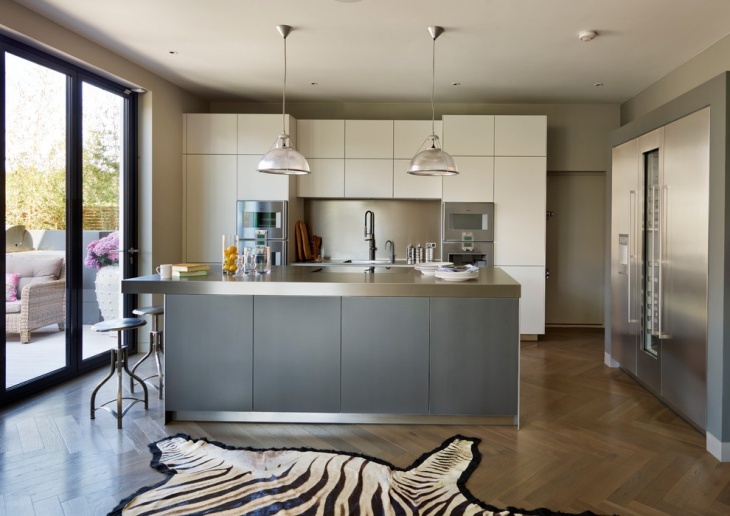 This modern kitchen looks really inviting with its open plan, sliding glass door and the perfect lighting brought by the three pendant lights hanging over the kitchen island and the huge oblong-shaped pendant light set over the breakfast table. The pale cream color of the lights’ casing allows for the light to diffuse softly. 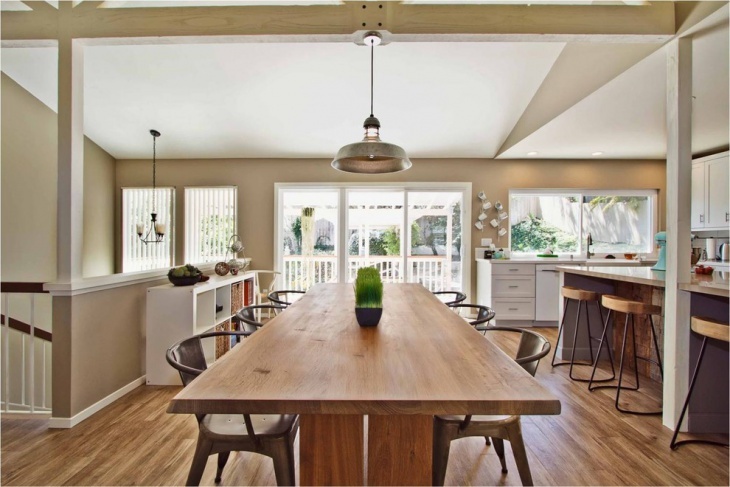 There is something about a home with an open plan design that really appeals to a lot of people. 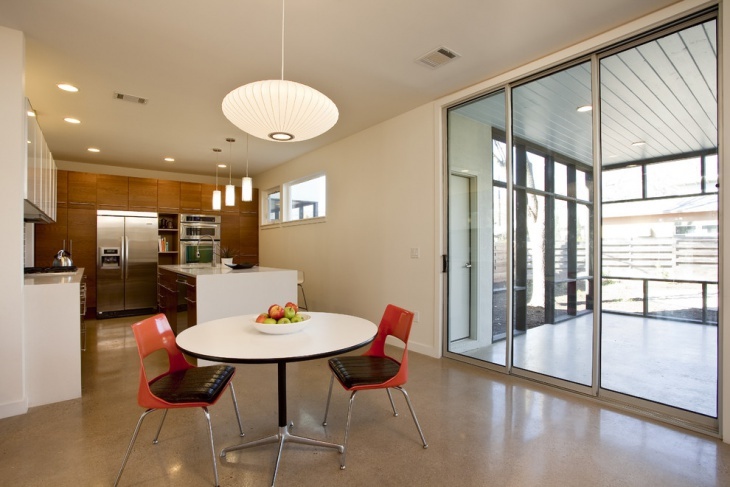 The easy transition from one room to another allows for easy access to everything. 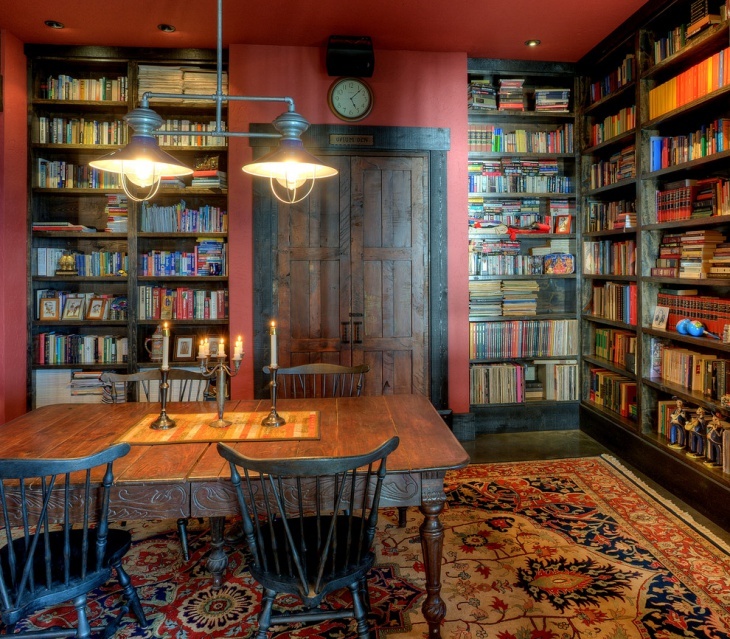 This interior design, for instance, is a good example. The layout is so open and the whole set up is made to look a bit industrial with the use of three pendant lights in a black colored metal casing. 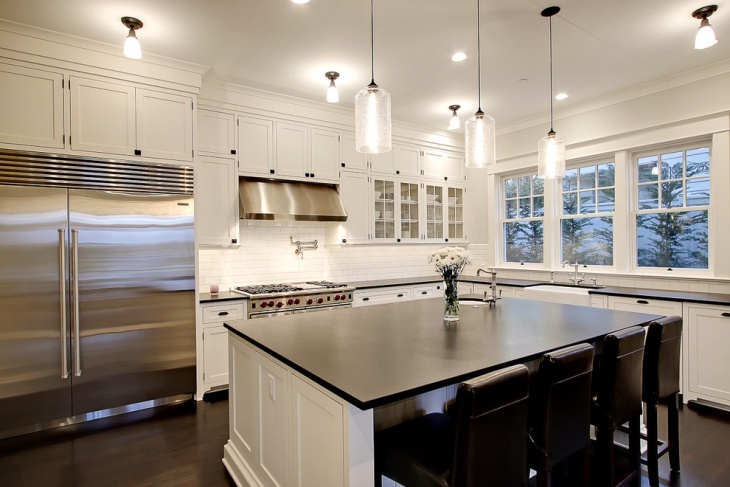 Caged pendant lights provide this immaculate kitchen with a bit of industrial look. Though the lights’ casings are just as white as the rest of the room, the black color of the metal cage provides a nice contrast. 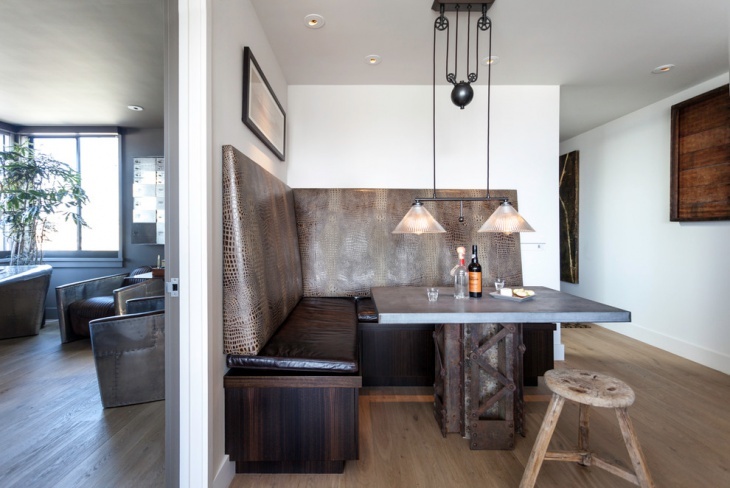 The copper cases of the pendant lights used for this bar/den provide a beautiful match to the industrial appeal of the room. 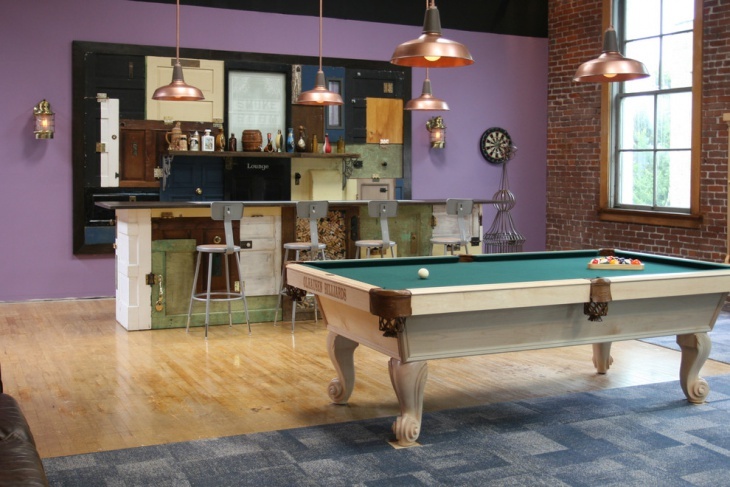 The room is basically a harmonious combination of different textures – unpolished brick wall with tall framed window, pale wood flooring, lavender colored wall, and the island base and bar wall made of repurposed doors. 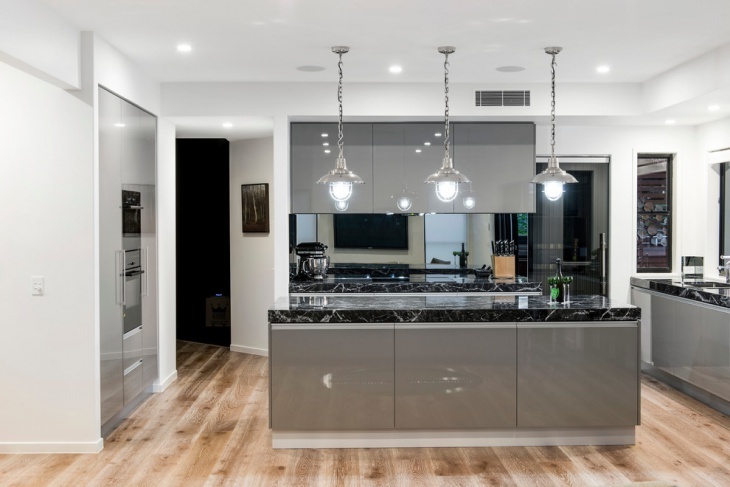 Industrial ceiling lights are ideal to use almost anywhere, even in rooms that are designed and styled to look formal and functional – just like this kitchen. 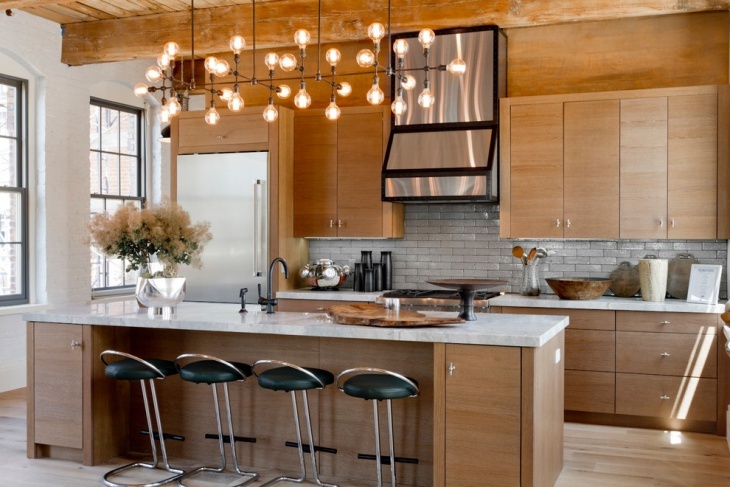 There is nothing else in this room that looks as industrial as the three pendant lights in crystal glass casings. 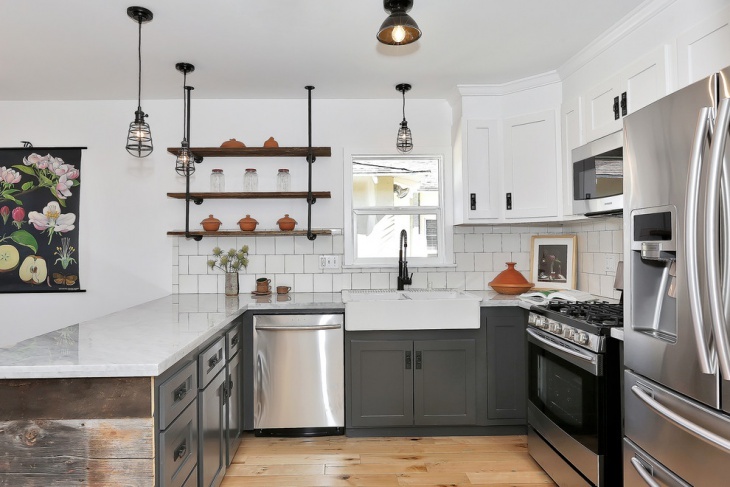 The two pendant lights used for this kitchen are really industrial, and they provide a nice contrast to the overall design of the room. 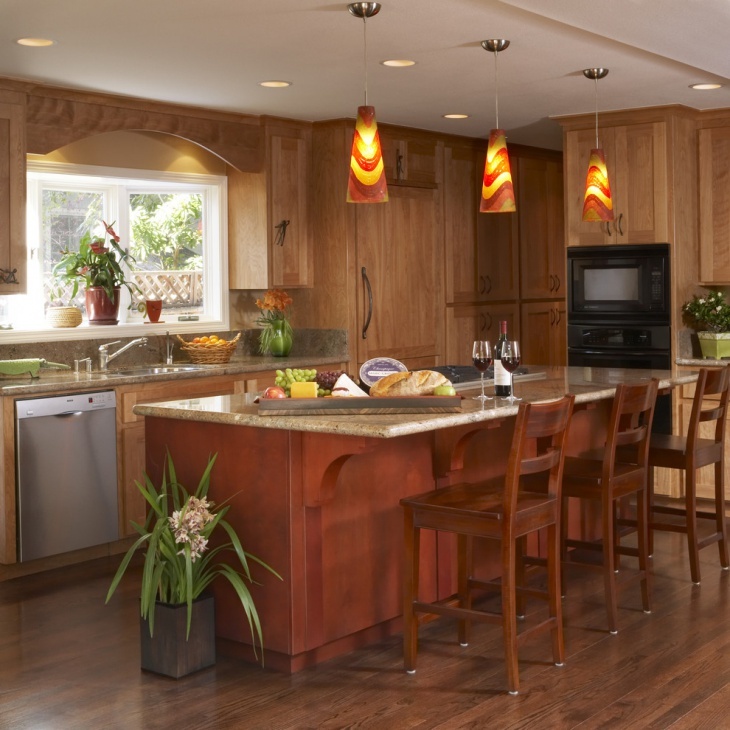 The room is basically in shades of brown – flooring in natural polished wood, island base in light brown wood, an upper wall in brown, brown backsplash tiles for the cooking area wall, and the palest fo brown for the cabinets. 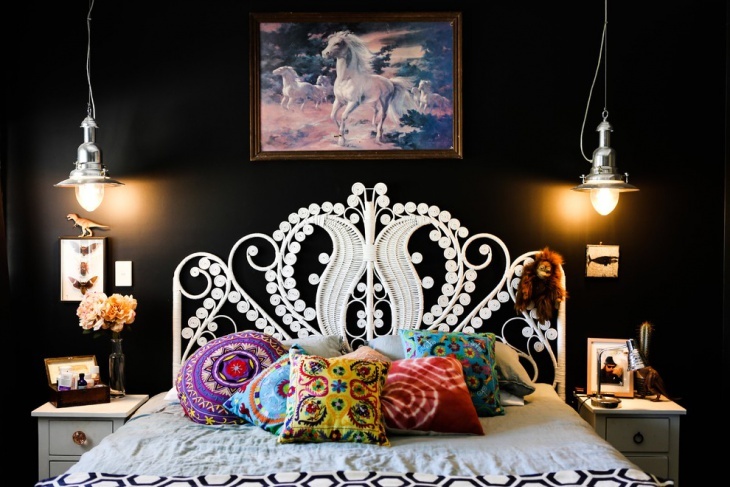 Black and white motif combo will never go out of style. 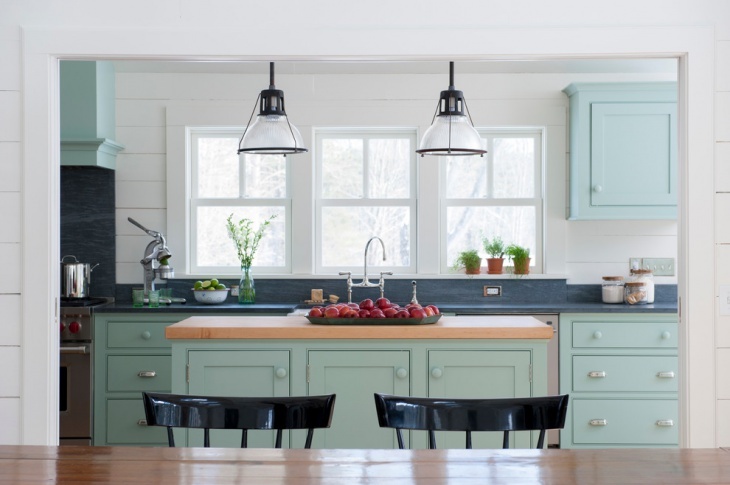 This is the perfect color combination that can be used in any interior design or style you want. 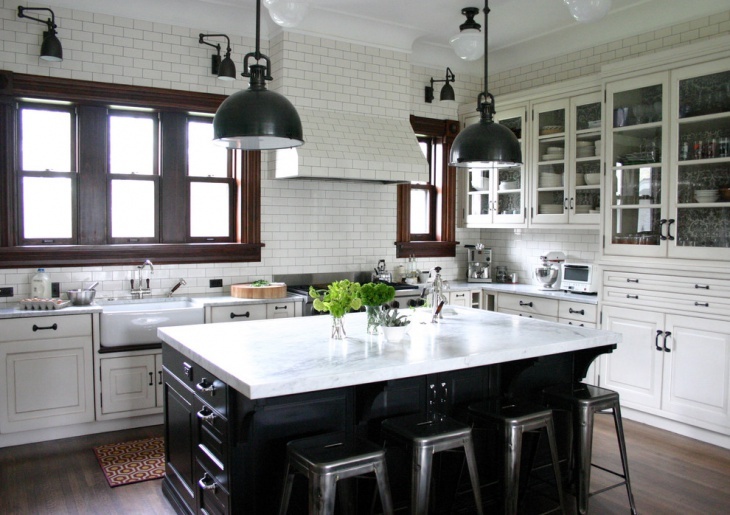 This kitchen, for instance, has the ideal traditional and industrial design combination. Everything about this room is traditional actually, except for the industrial pendant lights that create a nice contrast.